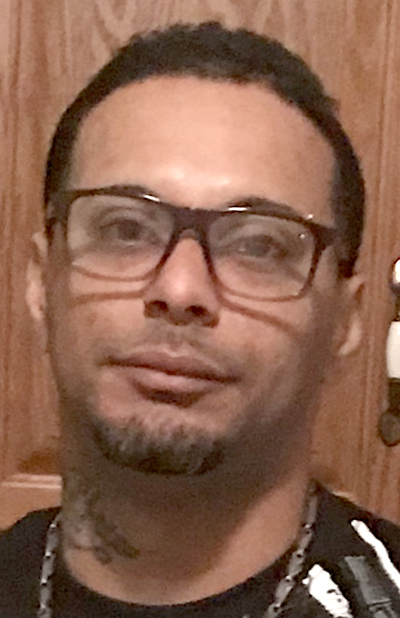 Hector Rene “Pito” Negron, 37, of Harrisburg, passed away on Friday, Aug. 24, 2018. He is survived by: his parents, Hector Burgos Jr. and Magda M. Negron; his wife, Clarice M. (Storm) Negron; children, Angelinette, Hector J. Negron, Gianna Negron, Elizabeth Negron, De Angelo Negron, Giouvanni Negron, Armani Negron, Tiosha Lyles and Tyler Lyles; a grandson, Dylan Ian; siblings, Zuleika M. Marquez Negron, Orlando Felix Negron, Rolando Felix Negron, Francisco Felix Negron and Magda Maria Felix Negron. Hector attended Locust Grove Mennonite Church. He was a good boxer in his younger years. He was a music artist who enjoyed the art of rap music. Hector loved his children and enjoyed time with his family. A viewing will be held from 6 to 8 p.m. on Thursday, Aug. 30, 2018, at Heller-Hoenstine Funeral Homes, Woodlawn, 200 N. Main St., Lewistown, with a funeral service to follow at 8 p.m. at the funeral home, with Pastor Salgado officiating. Online condolences may be offered to the family at www.hellerhoenstinefunera lhome.com.